I found a copies of the Almanach national de France on the Bibliothèque nationale de France web site. 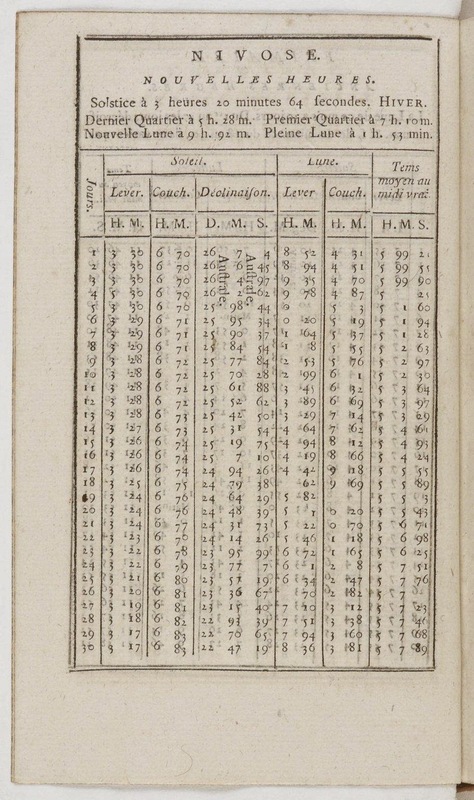 The edition for the second year of the Republican Calendar (l'an deuxieme), 1793-94, includes astronomical tables with decimal times. You can also see the times for the equinoxes and solstices and the phases of the moon written out. Solstice á 3 heures 20 minutes 64 secondes. HIVER. Dernier Quartier á 5 h. 28 m. Premier Quartier á 7 h. 10 m.
Nouvelle Lune á 9 h. 92 m. Pleine Lune á 1 h. 53. min. Hiver is winter. The phases (top to bottom then left to right) are last quarter, new moon, first quarter, full moon. 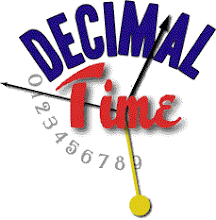 As I have pointed out before, I usually see decimal times today written with colons, although using colons was not common back then, but rather h and m. Using a decimal mark (which is the comma in French) would make more sense. Even today it is common in French to use h and m with standard time. Here you see a decimal time for the winter solstice written out in full with hours, minutes and seconds, corresponding to 3.2064 decimal hours, and the rest abbreviated, corresponding to 5.28, 9.92, 7.10 and 1.53 decimal hours. Where there is room, minutes are abbreviated as min., or m. where there is not. Therefore, I prefer using the old-style French notation, as shown here. I can tell that most of the times are "true time", or local apparent solar time, which varies throughout the year in relation to mean time, and is shown by sundials. The last column shows when true solar noon occurs in local mean time. All times are relative to Paris. Quartidi 14 Fructidor an CCXXII à 10 h. 84 m. t.m.P. The NPR program On the Media publishes a podcast and blog called TLDR, which is an Internet abbreviation for "too long; didn't read". On MJD 56896.7 (August 27) they re-released a podcast originally released on 56701.6 (February 13), which was about Swatch's Internet Time. You can listen to the podcast and read the transcript.